With those five struggles in mind I decided to write this article. I hope it’s an encouragement to other stressed-out INFJs in the world! As an INFJ you crave a peaceful, harmonious environment and you will go to great lengths to preserve that. While this isn’t always a bad thing, it can mean that you stifle your own anger and frustrations altogether. You may stop yourself from voicing your opinions because you don’t want to disrupt harmony. This is something I personally have struggled with throughout my life. I always felt like anger was a “bad” emotion, one that I should try to channel into constructive methods. It wasn’t until a week ago, when I sat across from my therapist telling her (and myself) “No, I’m really NOT angry”, that I realized that it was OKAY to be angry. I needed “permission” to be angry about some things in my life. Anger is an important emotion. There’s nothing wrong with feeling it or expressing it if in a safe, healthy way. Find a quiet place to park your car and let yourself scream if you need to. Be direct with your feelings and express when you’ve been hurt. Find a friend you can trust and vent to them if you need to. Journal your anger. But don’t continually ignore it and repress it because that can make you feel even worse in the long run. If you’re an INFJ with a lot of responsibilities you tend to feel like everyone else’s needs are more important than your own. All FJ personality types tend to struggle with putting other people’s needs ahead of their own. This can eventually lead to burnout, overwhelm, and an overflowing to-do list. Don’t guilt-trip yourself for taking some time to rest, recover, and do things that only you find enjoyable. Practice saying “No” to non-essential commitments. Practice saying “I want to do ____” instead of trying to cater to whatever everyone else wants all the time. Caring for others and meeting their needs is admirable, but just make sure you aren’t steamrolling over your own needs at the same time. If you’re stressed as you’re reading this, the best thing you can do right now is shut off excess noise. Turn off the TV. Turn off the radio. Find your kids some quiet activities to do in a separate room. Turn off bright lights. Shut your computer and turn off your phone. Lights, noise, stimulation and distractions are all your enemy when you’re stressed. Unplug, quiet things down, and get into a space where you can let your mind just “be” without having to be focused on several things at once. As an INFJ you tend to absorb the feelings of the people around you. This results in you feeling the need to take responsibility for other people’s emotions. If someone is sad you try to fix it right away because YOU feel sad. If someone’s angry you try to solve their problem because now YOU feel angry. If someone is depressed you lose motivation and focus because now YOU feel depressed. When you start noticing other people’s emotions bleeding into your own take a conscious step back and remind yourself that those aren’t YOUR feelings. It’s good to be compassionate. That’s something people will love about you. But put up a mental barrier between yourself and the emotions around you so that you can avoid becoming dependent on everyone else being happy constantly. Feeling like your inner serenity is dependent on people with all their own problems and issues is overwhelming. It’s also important to allow other people to deal with their emotions independently sometimes. As one of the rarest Myers-Briggs® personality types, you are easily misunderstood. You are always looking for the underlying pattern or meaning behind all things. You read between-the-lines, think forward in time, and get random epiphanies about how things will play out in the future. People may be skeptical of your ideas and try to back you out of your position. This can result in a feeling of isolation and a sense that your natural way of thinking isn’t “right”. I’m not saying that every single idea or vision or prediction that you have is accurate, but I AM saying that you shouldn’t write yourself off quickly. If you’re constantly questioning your instincts and intuitions you’ll wind up stressed and unable to utilize one of your greatest gifts. Create a calm, quiet space where you can let your mind wander. Shut off lights, sounds, and distractions. Write down any thoughts, ideas or symbols that come to your mind. Over time learn which ideas or predictions are just paranoia and which ones actually have meaning. Practice giving your intuition a “voice” in your life. If you’d like more ideas about how to tap into your intuition, read this article: 10 Intuition Hacks for INFJs and INTJs. Was this article helpful? Do you have any thoughts or insights to share? Let us know in the comments! 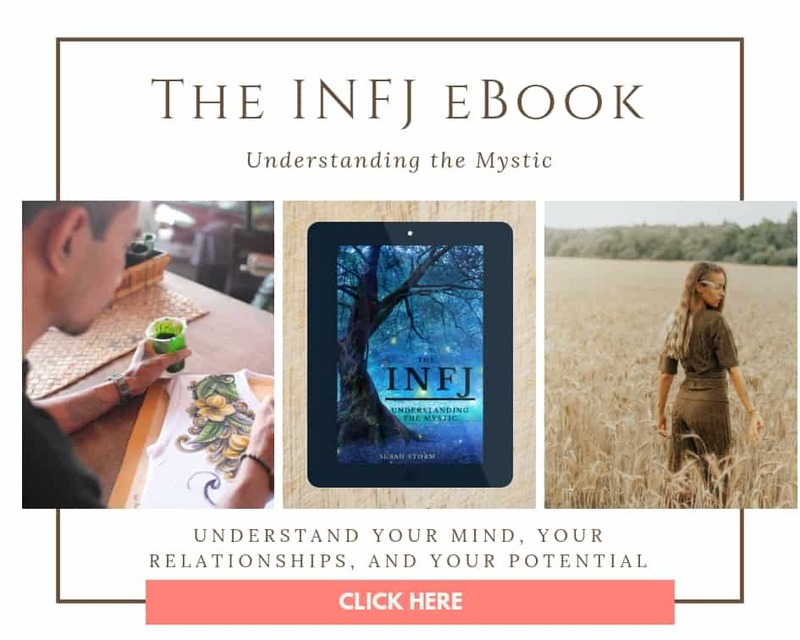 You can find out more about the INFJ mind in my latest eBook, The INFJ – Understanding the Mystic. Thanks for this post, Susan 🙂 I really needed a reminder of #4 today (actually for a while now). I had to disappoint someone several months ago and they still seem upset about it, and now every time I see them I drive myself crazy trying to figure out how I could have handled it better. It’s been damaging my “inner serenity” and I really do just need to let go and realize I can’t be responsible for how they might feel anymore.